This Singapore Airlines Business Class flight was booked using a combination of cash and miles. Singapore Airlines had ha really good sale a few months ago and I took advantage of it by booking a premium economy class ticket from Los Angeles to Phuket for $1200. I then used 38,250 miles to upgrade my outbound LAX-HKT flight to business class. My outbound business class routed through Seoul and my return in premium economy routed through Tokyo. You can click here to read my Singapore Airlines Premium Economy flight review. At LAX, Singapore Airlines operates two daily flights to Singapore, SQ7 via Seoul and SQ11 via Tokyo. Both flights are operated by Boeing 777-300ERs. There are two versions of Singapore Airlines Boeing 777-300ERs. The only difference between the two is the addition of the premium economy class cabin. If you are booked in business class, the seats are exactly the same so you don’t have to worry about one being better than the other. But in case you’re wondering, this flight was on a 4-class Boeing 777-300ER. This version is configured with 4 first class seats, 48 business class seats, 28 premium economy class seats and 184 economy class seats. First class is very exclusive with only 4 seats in a 1 x 2 x 1 layout. In business class, there is a forward, mini-cabin with just 12 business class seats in a 1 x 2 x 1 layout. I would choose seats in this mini-cabin if you can as it will be quieter and have less foot traffic compared to the main business class cabin (especially if it is full). Whereas the main business class cabin has 30 seats also in a 1 x 2 x 1 layout. Aft of the main business class cabin is the premium economy class cabin with 28 seats in a 2 x 4 x 2 layout. And lastly, there are two economy class cabins with 184 seats in a 3 x 3 x 3 layout. At LAX, Singapore Airlines operates from the Tom Bradley International Terminal (TBIT) and uses the Star Alliance Lounge for their premium cabin passengers. The Star Alliance Lounge at LAX is one of my favorite business class lounges in the world. The lounge is open, spacious and has great amenities. 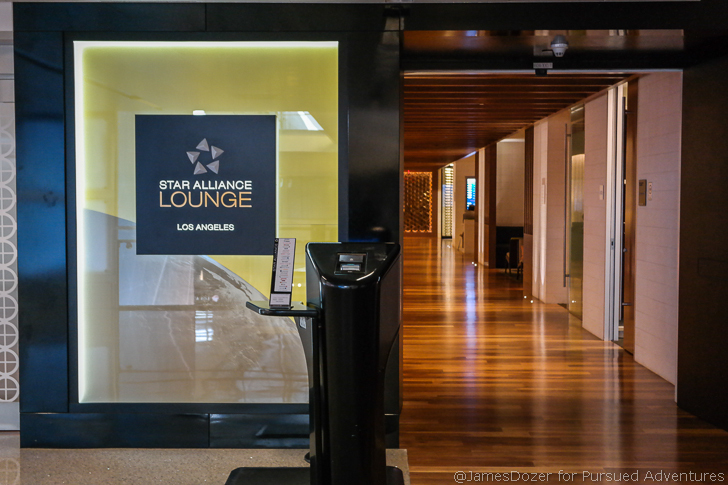 Click here to read my full review of the Star Alliance Lounge LAX. When I checked in, I was advised boarding would commence sooner than normal because our flight would be departing from a remote gate today. The bus gates at LAX are kind of a pain and it took me about 10 minutes to walk from the Star Alliance Lounge to gate 138. Boarding started with first and business class passengers and Star Alliance Gold members but everyone just boarded the same bus anyways so it didn’t really matter. After a short bus ride, we arrived at our remote stand. As I entered the aircraft, I presented my boarding pass to the flight attendant and was directed to my seat, 11K, a bulkhead window seat located on the right side of the aircraft. Before I even talk about the seat, let’s just admire how beautiful this cabin is. These Singapore Airlines Business Class seats are not perfect by any means but I personally like them. Unlike other people, I care more about the width of my seat than I do the length of the seat and this is the widest seat I have ever experienced in business class. According to Seat Guru, these Singapore Airlines Business Class seats measure 28 inches in width and 55 inches in pitch. That’s wider than some first class seats! Waiting at our seats were a menu, pillow and a pair of Phitek branded, noise-cancelling headphones. Storage-wise, there are no overhead storage bins above the center seats so all carry-on bags have to be stored in the overhead bins above the window seats. However, there is plenty of space at the seat for backpacks, purses and other personal items. Bigger items can be stored underneath the foot rest and smaller items such as laptops, tablets, cell phones and eyeglasses can be stored in any of the storage pockets at the seat. Each seat is equipped with a personal, in-flight entertainment system, USB/universal electrical outlets, several reading lamps and a vanity mirror. Seat, lighting and and TV controls are located down by your hip. OnAir WiFi is provided on this aircraft but it’s priced at $20 for each 50 megabytes of data. That’s way too expensive for my taste so I didn’t even bother connecting to it. The personal entertainment monitor is crisp and the KrisWorld entertainment system is loaded with a great selection of new Hollywood movies, TV shows, video games and music entertainment. If you love Indian or Chinese cinema, you will not run out of movies to watch. As I settled into my seat, the flight attendants came by offering a plethora of items from hot towels and pre-departure beverages to newspapers and in-flight comfort items. Singapore Airlines does not offer their business class passengers amenities kits or pajamas. Instead, each passenger gets slippers, socks and eyeshades. The lavatories are furnished with toiletries such as dental hygiene and shave kits, mouthwash, body lotion, perfume and facial mist. However, no facial creams or lip balms are provided. Once all the passengers were boarded, we then pushed back from the gate and made our way to runway 24L and took off towards the west. Other than Chicago, there really is no better departure view (IMHO). Once we hit our cruising altitude, the seatbelt signs were turned off and the flight attendants came by to prepare for our dinner service. Here’s a look at the dinner menu. However, business class passengers are afforded the “book the cook” service with an extended menu than what is offered onboard. Dinner started with a pre-meal beverage and a ramekin of warm nuts. My table was then set and a antipasto starter plate was served along with a bread selection. Once I was done with my starter, my plate was taken away and my main dish was brought out. For my main dish, I had pre-booked the Chilean seabass from the “book the cook” menu. Dinner concluded with Ben and Jerry’s ice cream, whole fruit and a coffee/tea service. Overall, the service was outstanding but the catering was just okay. I was always addressed by name and my glass was never more than half-empty. The flight attendants were friendly, attentive and proactive in taking care of the passengers. That being said, the food wasn’t anything great. The flavors were lacking and the consistency felt over-cooked. After dinner, the flight attendants made a pass with the duty-free cart and then all the window shades were closed and the lights dimmed. After staying up for a bit, I tried to make my bed but couldn’t figure it out so I had to ask for help. These seats are a little awkward in that they do not recline flat. They actually have to be flipped over into bed mode. The seats do recline approximately 45 degrees but to go lie-flat, you have to flip the seat forward. Turn down service included a blanket and second pillow. Here’s the other awkward thing about this seat. It’s a forward facing seat but you actually sleep diagonally towards the window. Doing so will actually add about two feet to the bed length. So in my picture below, you don’t sleep straight towards the TV. You actually sleep with your feet pointed towards the corner. It’s weird but it works. Other than it being a little hard, the flat surface of the bed was wide and spacious and allowed me to get about 4 hours of sleep. However, keep in mind this is a bulkhead seat. With the other seats, your feet do go into a cubby hole like this. You won’t have an option but to sleep diagonally. After a few hours, I woke up hungry and asked for some food. For my snack, I ordered a bowl of noodles and a glazed donut from Randy’s Donuts. This snack was probably the best meal I had on this flight as the pre-arrival meal wasn’t anything spectacular either. Approximately 1.5 hours outside of Seoul, the cabin lights were turned on and our pre-arrival meal was served. My supper started with a parma ham appetizer and my main dish was a prawns with vegetables plate. And just like my dinner earilier, this meal also lacked flavor and didn’t taste all that great. Dessert was a mango and cheese cake. This flight continues onto Singapore but unfortunately, all passengers must exit the aircraft in Seoul. Arriving passengers will head towards customs and immigration and all continuing passengers must clear through security before boarding the aircraft again. Tip: don’t hold onto your water bottles because you will have to dump them out at security. At ICN, there is a SilverKris Lounge for business class passengers and Star Alliance Gold members to get some food and freshen up with a quick shower. The SilverKris Lounge in Seoul is nothing special and was crowded at the time of my visit but it will be better than waiting at the gate. For those not traveling in a premium cabin, there is a Priority Pass Lounge you can use. The KAL Lounge is located across from the SilverKris Lounge and also offers hot food, WiFi and showers for transiting passengers. Click here to read my full review of the KAL Lounge. If you are booked all the way to Singapore, Singapore Airlines’ website will not let you choose a different seat for the second segment. Your seat selection for the LAX-ICN segment will carry over. As we boarded the aircraft, the flight attendants came by with pre-departure beverages and hot towels and then took our supper selection. There is only one meal served on this flight so you can choose to have it right after takeoff or right before arrival into Singapore. I chose to eat right after takeoff. However, the lights were dimmed right away and kept off for the majority of the flight to accommodate the passengers wanting to rest. My one meal for the flight consisted of a fruit cup followed by my main dish. I actually forgot what I ordered but I think it was some lamb dish with potatoes and carrots. It didn’t taste very good. After supper, I slept for a few hours and woke up just prior to our initial descent into Singapore. This flight was rather uneventful. Overall, this flight wasn’t the best by any means but I did enjoy my Singapore Airlines Business Class experience. I personally love the wide seats and the service was amazing. The flight attendants were friendly and attentive and the entertainment system was plentiful. The food was lacking in flavor and I didn’t like not being offered an amenity kit but overall, it was still a positive experience. Have you flown Singapore Airlines Business Class? If so, please share your thoughts with us in comments section below. Thanks for reading!